Do you have a Citroën 2CV Sahara sitting in your barn, shed or garage? If so you may want to slip down to the corner champagne shop and pick up a bottle of Moet et Chandon or Louis Roederer Brut Cristal. Of the 694 Citroën 2CV Sahara built only 27 are known to exist today. This means that those 27 cars are rare collectibles fetching decent champagne sabering money at auction. For examples click here and click here. This also means that there are likely to be quite a few undiscovered examples distributed throughout the old French colonies and in all sorts of other places around the world just waiting to be found. To find out if you have an ordinary common 2CV or an uncommon 2CV Sahara the first thing to check is how many engines does it have? The common 2CV have one engine like most other cars on the road. The 2CV Sahara however has two engines, one in the back, and one in the front, as you will see in the following video. Two engines, two gearboxes and differentials, and two fuel tanks. This was viewed by Citroën as a way to get as good reliability as one could. It’s the same thinking behind a double rifle, two barrels with two independent firing mechanisms so if one fails the other is still operational as a last resort. If you are out after dangerous game a double rifle is the preferred tool for the job. With a car that was intended to be used in places that are remote, where a breakdown can become life threatening rather than just inconvenient, two engines mated to separate fuel tanks and drive trains provides similar insurance against serious problems as does a double rifle. Citroën 2CV Sahara, engine in the front. (Picture courtesy Wikipedia). Citroën 2CV Sahara, engine in the back. (Picture courtesy Wikipedia). 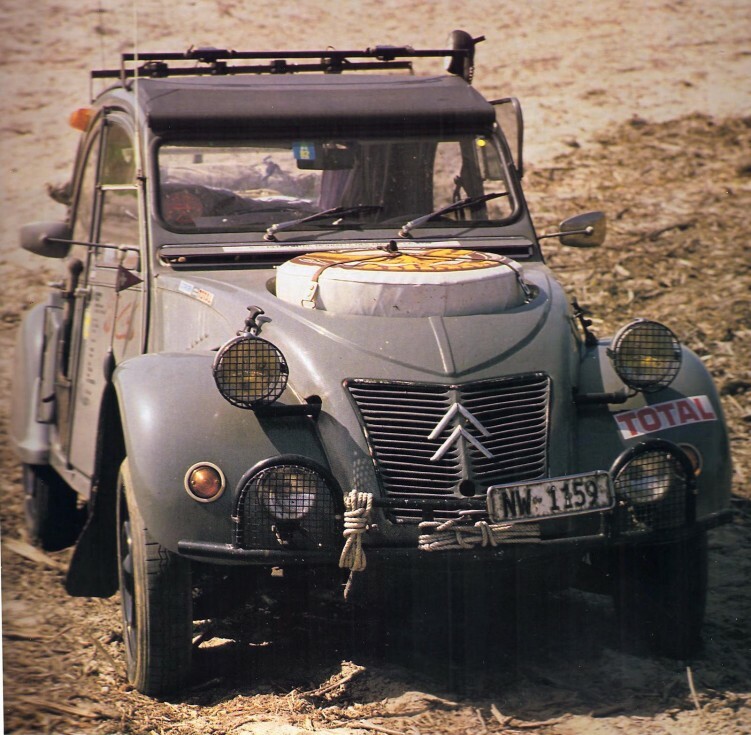 A Citroën 2CV Sahara would have been an ideal vehicle for hunting where we will be going off the beaten track and want to be able to get back to the beaten track when we’re done hunting. The next thing to look for to see if your barn find Citroën 2CV is a Sahara. Does the car have a spare tyre mounted on the bonnet/hood? If it does then you’ve likely got reason to smile, and perhaps perform a little happiness dance around the barn. 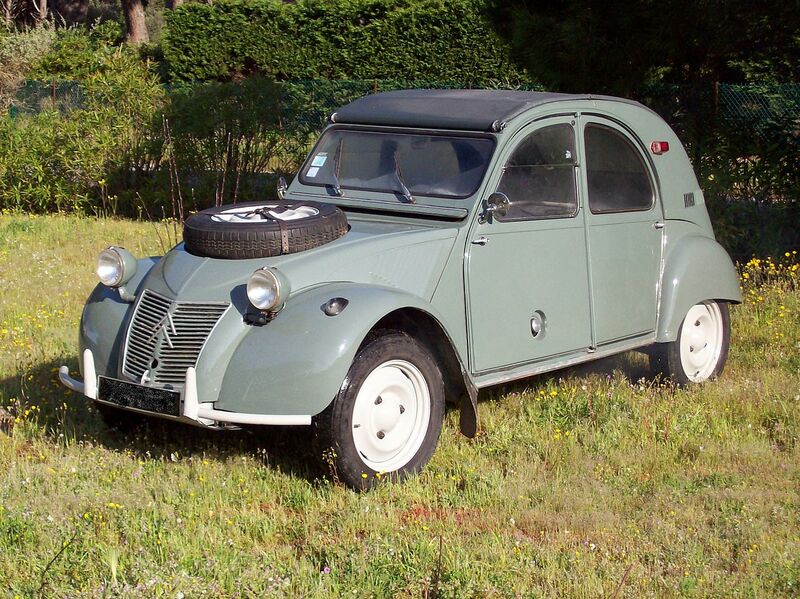 The Citroën 2CV Sahara has a spare tyre mounted on the bonnet/hood Land Rover style. Also note the hole for the crank handle in the front grill. So it is possible to hand crank the engine to start it in the event of a flat battery. (Picture courtesy Wikipedia). The Citroën 2CV Sahara was created to be an expedition vehicle, and a vehicle for people in such places as France’s ex colonies in North Africa where oil exploration and management was a priority, people who needed four wheel drive and good breakdown redundancy built in. In a sense the car is contemporary with Britain’s Land Rover and has a similar design brief, but done in Gallic style. The Citroën 2CV Sahara typically led demanding lives, and could be found even in such places as Israel where the National Park Authority used them. But being used in rough and demanding environments has meant that very few of these wonderful little cars has survived. Those that have made it through into the twenty first century commonly don’t still have their original chassis. Rust has often destroyed the original chassis of 2CV Saharas. When used in rough conditions the chassis of a car almost inevitably gets some damage, rust proofing paint gets scratched off, and over the years corrosion sets in. Given the lives they’ve endured it is little wonder few Citroën 2CV Sahara survive, and that most of those that do are on a different chassis. (Picture courtesy ranwhenparked.net). Given that it will be rare to find a Citroën 2CV Sahara in original condition potential buyers need to be aware of what to look for if valuing one. The body panels of the 2CV Sahara are not interchangeable with the body panels on a typical 2CV. Many of the parts used in the 2CV Sahara are unique to it. However a restorer, unable to find original Sahara parts, may well restort to using ordinary 2CV parts or panels. The end result is a nice looking restoration, but the value of such a car must be much lower than one that is all original. The Citroën 2CV Sahara was produced in two versions beginning in 1958 and ending in 1966 as per the following table. Production dates of the 2CV Sahara. (Table courtesy Wikipedia). The Citroën 2CV was a most appropriate base car for the creation of the Sahara all wheel drive version. The original design brief of the pre-war thirties was to create a car that was light, inexpensive, easy for the owner to repair and maintain, and capable of all road and some off road driving. One of the interesting statements in the original design brief was that the car must be able to cross a ploughed field safely carrying eggs, so that a farmer could carry their eggs to market. This led to the use of a semi-independent long travel suspension, ideally suited to the later four wheel drive Sahara. 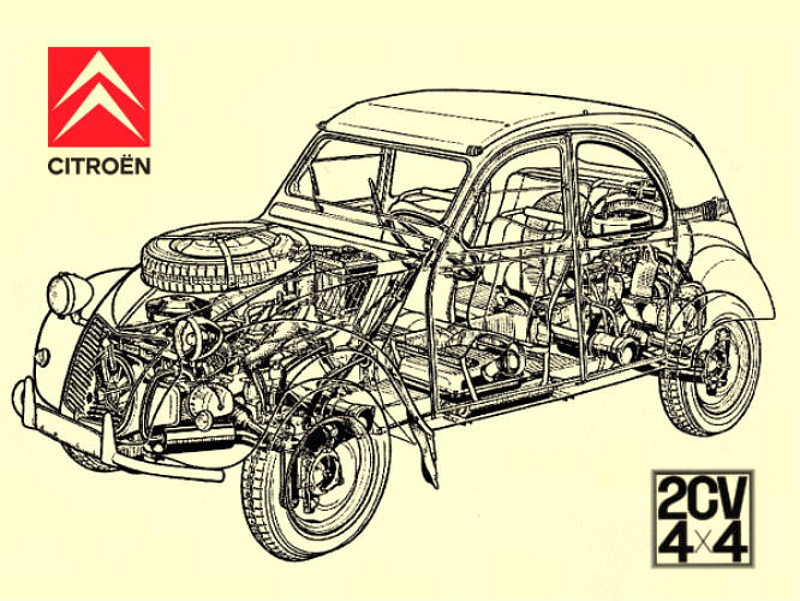 The engine of the original 2CV was a horizontally opposed air cooled two cylinder of 375cc producing only 9hp. 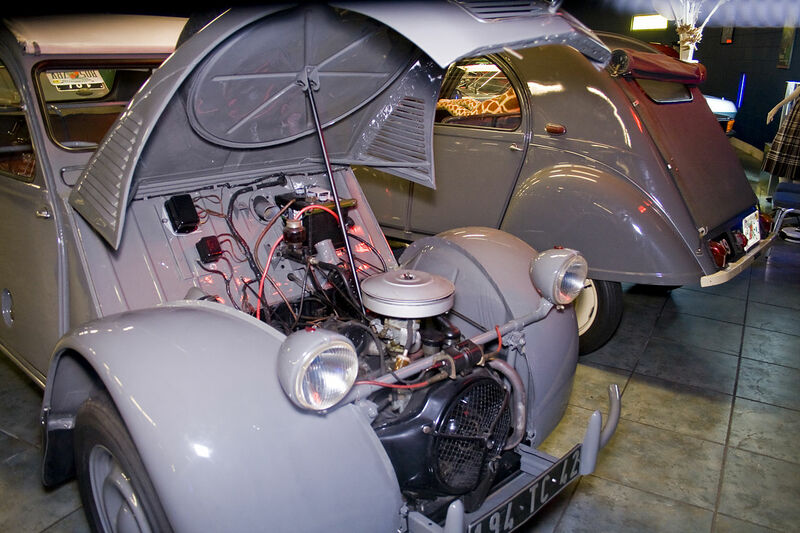 At the beginning of 2CV Sahara production the engine size had been increased to 425cc producing 12hp. 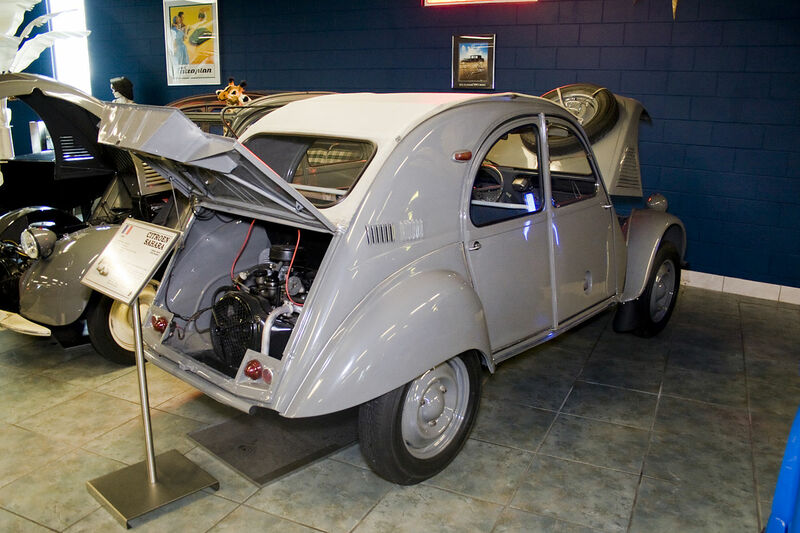 The later series 2CV Sahara getting 435cc engines producing 18hp each. 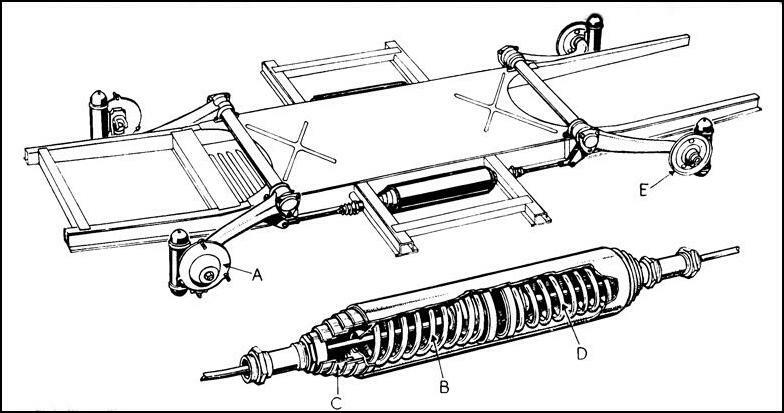 Suspension of the 2CV involved front leading swinging arms and rear trailing arms whose springs were horizontally located in cylinders. See diagram below. Suspension system of the 2CV was kept simple and rugged. (Picture courtesy autospeed.com ). 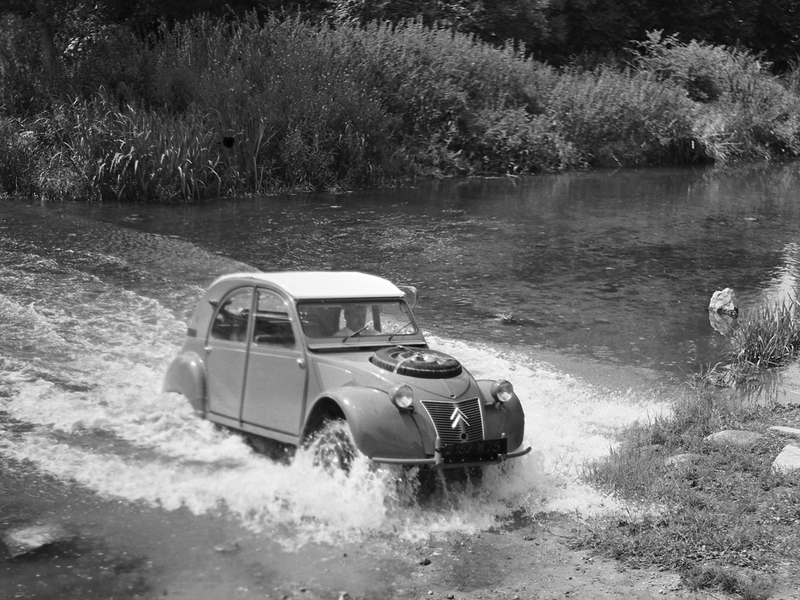 The ordinary 2CV have been used for all sorts of long distance endurance drives and rallys. The combination of ruggedly simple design, intentional ease of repair, and rugged construction has ensured the 2CV developed a good reputation despite some of its austere oddities. The 2CV Sahara, if you can find one in original condition, preferably with a chassis with minimal rust, is one of those worthwhile restoration projects out of which you are likely to make money. One appeared on Bring A Trailer in mid December and that one has so far failed to meet its reserve price. Click here to see the post on that one and click here to see the sale page. Another one is coming up for sale in the near future on WeLoveCars.com. You can find that one and contact details if you click here. Personally I would like one of these as a shooting wagon. Unfortunately given their scarcity and collector value that’s a little ambition I am unlikely to fulfil, c’est la vie. If you have a Citroën 2CV that you intend to restore you might want Lindsay Porter’s book “How to restore Citroën 2CV” available on Amazon if you click here. Scalextric have also made a slot car model of the Citroën 2CV Sahara and models are often available on eBay. You’ll find an example if you click here. Or just do a Google search for “Citroen 2CV Sahara Original 657” which will find quite a few. Citroën’s 2CV Sahara is a fascinating little car with an interesting history. I think its a shame that they’ve acquired such a high collector value, but if you have one in your barn just waiting for a buyer then the high collector value is something you’re going to be very happy about.